The above info came from Mel, and was edited by yours truly (contact me). The image came from JLE. Vash is a peace loving, donut eating, girl crazy pacifist. He travels around "Planet Gunsmoke" (the name on the toy box) and tries to bring peace to where there once was chaos. Unfortunately he has no luck and wreaks more havoc than he can fix (poor guy). His past is a mystery. Unbelievable rumors about him flow through the public like wind. He changed one of the Seven Cities into a mountain of rubble, made a big hole on the Fifth Moon, and some say he was directly involved in the Big Fall, the crash of the spaceships, over a hundred years ago. There are many who doubt the existence of this half legendary figure. There are, however, those few who have dealt with him closely tell of his true nature. His good nature is unparalleled but credulous. He hates conflicts. A soft-hearted guy who is a pacifist and who had never killed a soul until forced to do so by Legato. Yet those rumors have just one thing in common...that he is superbly skilled in gun techniques. Once his gun (an AGL ARMS .45 Long Colt) is fired, no enemy remains standing. Conflicts end unquestionably. Another interesting note is that Vash's left arm is actually cybernetic. The hand lowers to reveal a concealed gun. But believe it or not, it's his right arm that's the more dangerous. If there's one more thing that's certain about him, it's that this devil who wears a red coat is watching people's lives from a distance. He appears and disappears throughout the history of the planet. Are there many men who carry his name from generation to generation? Or is this one and the same person? His past is a mystery. Rem comments that Vash looks like "Alex", who died prior to the first episode (which is shown in a flashback cut scene showing that Alex committed suicide and went into a highly radiated zone: the ship's plant). After this, Rem goes looking for him to find his body disintegrating and his DNA scrambling throughout the inside of the plant. By the time the rest of the crew arrives to try to stop him, his body is totally disintegrated and his DNA scrambled to numerous plants. The one closest to Rem contained two "newborn" babies, Vash and Knives. 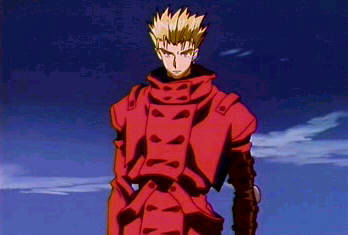 Vash's height has been a different source of mystery to Trigun fans. 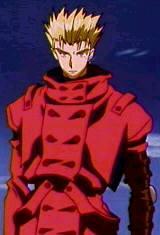 When Vash entered the quick draw tournament, his height was listed as 7'20". If this measurement is intended to be in feet and inches, then it makes no sense seeing as how there are only 12 inches in a foot. Some suggest that it should 7'2.0", while others feel that it was probably supposed to mean 72" (which would be 6 feet). And then, of course, it could just be some made-up units that don't have anything to do with either feet or inches. Even Yasuhiro Nightow, creator of Trigun, doesn't know exactly. 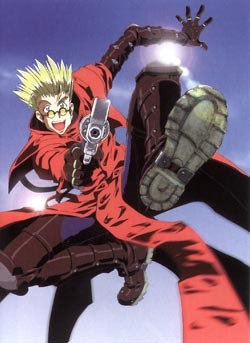 In a quote referring to the Trigun manga, he said that Vash was "about 180 centimeters, more or less, I guess." The above description came from Mel and V.T.S., and was edited by yours truly (contact me).